OMG, we're entering Russia today! I'm so excited! And a bit scared. Out of all the countries we've traveled to, for me, Russia is the one that holds the most fascination and also the most uncertainty and trepidation. I was a child of the 80s. I grew up during the tail end of the Cold War with constant reminders of the impending nuclear armageddon blaring on all the channels and plastered on all the headlines. The newspapers and magazines were always full of stories of Mutually Assured Destruction, Doomsday Clocks and nuclear winters. The movies I grew up watching were Rocky IV, Red Dawn, Firefox, Red Heat, White Nights, Gorky Park and Moscow on the Hudson. At that age, I was on a 24-hour diet of music videos: Genesis' "Land of Confusion", Iron Maiden's "2 Minutes to Midnight", Sting's "Russians" were all featured heavily in the rotation. For an entire decade. I was continually bombarded with images and information that taught me that the Soviets hated us and wanted nothing more than to wipe the Western world off the globe with their arsenal of thermonuclear intercontinental ballistic missiles ("Do you want to play a game?") - each individual one of them stenciled with a red hammer and sickle on the side. Things change. The wall fell. Some bald Russian guy with a stain on his head introduced glastnost and perestroika to the Western lexicon. The USSR became Russia. AC/DC played a huge concert in Moscow and then suddenly overnight everyone became friends again. But it's not that easy to forget how it felt to grow up under the threat of nuclear holocaust. Thirty years later, we're riding our motorcycles towards the Finland/Russia border and I've got butterflies in my stomach. Just last year, Russia annexed the Crimea. Their actions were condemned worldwide and the entire country is now suffering through economic sanctions. Everyday, the headlines shout dire warnings about the proxy war that's escalating between Russia and the US in Syria. It feels like the Cold War all over again and I'm more feaful of today's border crossing than I was when we first crossed into Mexico. And also: Russia does not want tourists. 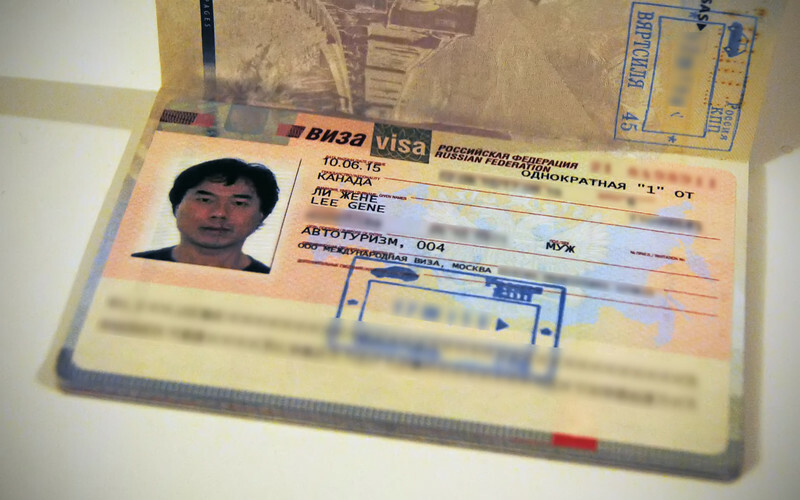 You can't just show up at the border with your passport and visit the Russian Federation. While we were in Toronto earlier this summer, I went through the steps to apply for a Tourist Visa - the first one we've had to do this entire trip. The form was long and tedious (see above). But worse of all, we had to state on the application the date and the place where we would be entering and exiting Russia. Even back then, that stressed the hell out of us. We had to cross reference our routes through Northern Europe and then Scandinavia, plan out each day's mileage, activity and rest stops in order to calculate a date so far in the future that we could arrive at the border. That's just not the way we travel. But we eventually came up with an entry date that felt right for us and then we started filling out the application form. "How long do you intend to stay in Russia?". Well, how long *can* we stay? "Maximum 30 days". Okay, we apply for a 30-day visa. We always apply for the maximum time at border crossings. Why wouldn't you? You have to submit your application in person at the Russian embassy, where they interview you. That sounds pretty serious. We made an appointment, showed up with all our forms and documents and the lady that interviewed us took one look at the dates we had requested and asked, "What are you planning on doing for 30 days in Russia?". I was taken aback. We didn't have any plans, we were just going to show up, look around and then leave when our visa expired. I made the mistake of saying this out loud. The lady at the Russian embassy shook her head. Well apparently this is not the way things work in Russia. You have to document in explicit detail your route, the cities you are visiting, when you'll be there in each city, the names and addresses of all the hotels which you'll be staying at - basically they want to know where you will be in the country every minute of your stay. The Russian embassy wanted us to show them hotel reservations *before* they were going to issue us visas. This seemed a bit backwards to me. It was very obvious: Russia does not want tourists. So our visa application was rejected. I want to say that the lady in the embassy did so with a thick Russian accent and with KGB-like ruthlessness: "Pearrr-mee-shun deee-nyed! 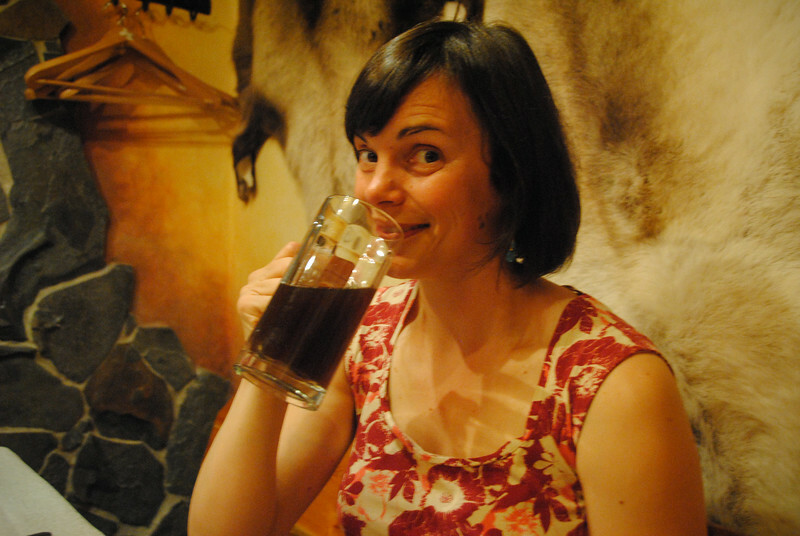 ", but really her accent was more Canadian with only a hint of Russian and she was quite nice and told us how to fill out the form again and rebooked us for another appointment. Armed with a thick sheaf of supporting documentation, we passed the second visa application. I like seeing my name in Cyrillic! Mother Russia here we come! So back to us in Finland. 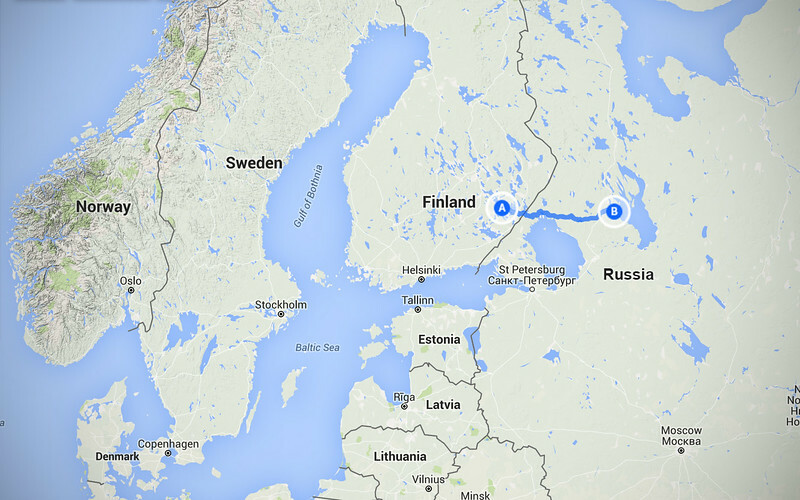 We are crossing at Niirala which is about an hour and a half east of Savonlinna. 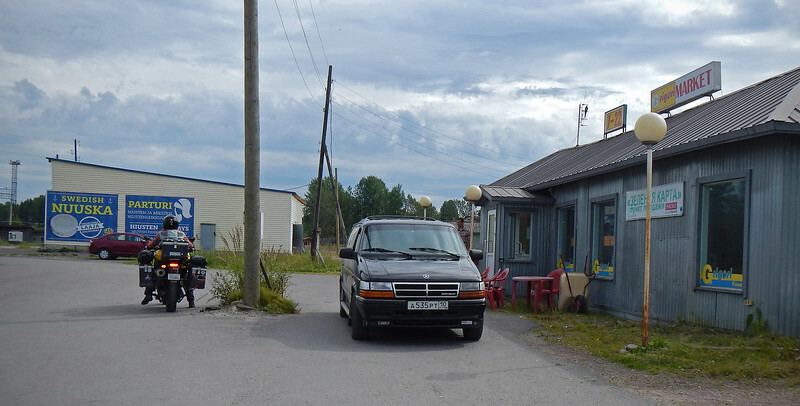 As we were being stamped out of the Schengen Zone at the Finnish side, the border guard smiled at us and warned us of the bad Russian roads. Uh oh. Would this be the last friendly face we would see for a while? 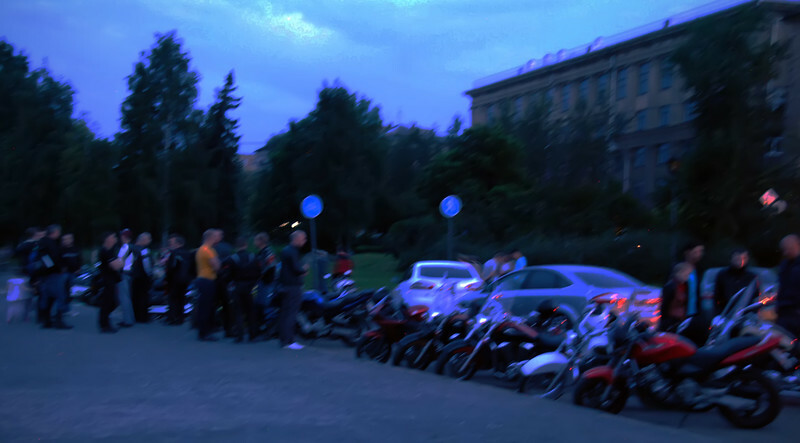 We lined up at the Russian border surrounded by vehicles with mostly Finnish license plates and a few with Russian Federation plates. I wanted to record everything about this exciting border crossing, but there was a sign with a camera and a slash through it. No pictures allowed. I remember all those 80s movies I saw about KGB interrogation and torture and I keep my camera in the tankbag. Finally it was our turn to cross, and we got off our bikes and walked up to the immigration booth. A young man working there, not more than 25-years old, flashed a big grin and welcomed us enthusiastically. Okay! This might not be so bad. He was so friendly and it was a great introduction to Russia. He was eager to practice his English and everything appeared to go smoothly. Until he stared in puzzlement at my visa and called his superior over (she was not much older than him, didn't speak as much English) and they talked for a while in Russian, pointing at my visa, talking more then shaking their heads. Uh oh. There was some kind of discrepancy with the visa. The embassy in Canada is familiar with Anglo names, so they know "Gene" is pronounced with a soft "G". The translated phonetic Cyrillic letter is "Ж". But in Russia, the equivalent of my name is Evgeni with a hard "G" (like "Ghetto") so they were expecting my name to be spelled with a "Г". That's КЯДZУ. I was assured it was not a big deal. I got my visa stamped and Neda cleared okay as well. *phew* I used one of the three Russian words I knew, "Spacibo!" So far, Russia was young, friendly and welcoming! ...Until we hit the second booth at the border: customs. Here was the old ex-KGB officer with the fur hat and the permanent scowl on his face. Demoted from torturing western spies, his job now was to make sure we didn't smuggle Finnish cigarettes into the country. We had to fill out forms to temporary import our vehicles into Russia and all the while his frowning face made me nervous. "Bravely we hope against all hope. There is so much at stake, seems our freedom's up against the ropes..."
I'm singing the theme song to Rocky IV in my head. I can't stop it. The ex-KGB officer glares menacingly at our paperwork, like a much older Ivan Drago staring down Rocky Balboa. And he stamps it. We're in! AHHHHH!!! We're in Russia! I know it doesn't sound very dramatic, but I was so nervous crossing the border. Neda on the other hand was quite calm and found all my worrying very amusing. Meh, she probably tortured quite a few western spies herself back in the 80s in Yugoslavia. Trying to find vehicle insurance. This search was so familiar. In Latin America, this would be called seguros para extranjeros. Once across the border, I knew we had to purchase vehicle insurance, but nobody at the border knew where we could go to get it. All the Finns crossing over already had their insurance, so they were of no help. Unfortunately, I forgot to look this up on the Internet beforehand, so we rode around asking random people where to get insurance. Neda had to use her Croatian/Slavic skills, which led us to the suspicious-looking shack above. They didn't have what we were looking for. So after spending quite some time riding around the border without finding insurance, we gave up and decided to forge on. The political situation in Russia is not the only thing that concerns me. 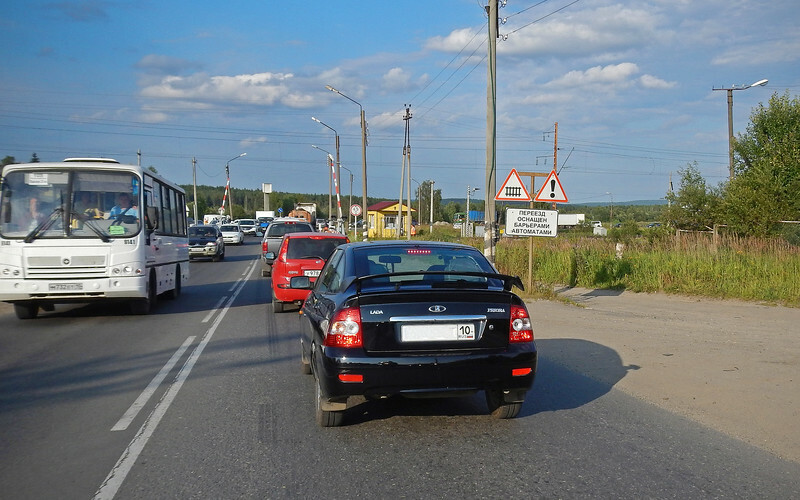 Everything that I've read warns me that Russian drivers are the most dangerous in the world. 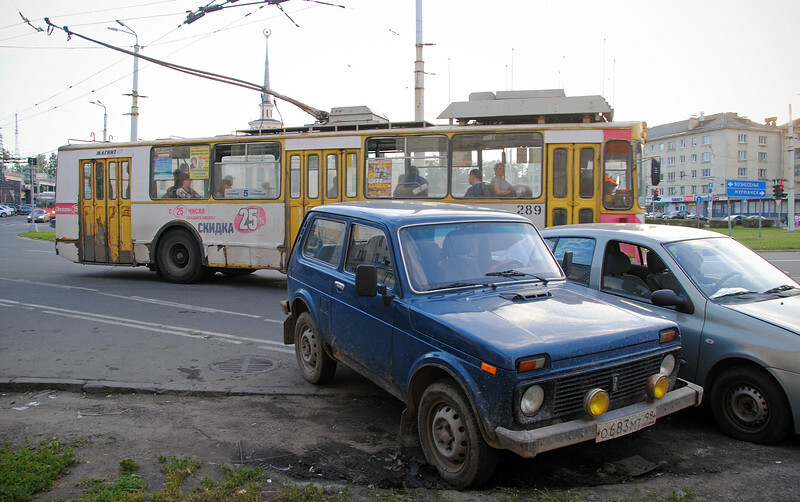 That coupled with the alleged corruption within the Russian police force makes us a bit nervous about riding without insurance, but what can we do? While we're in Russia, it's decided that I will do all the leading because Neda is a chronic speeder and finds it physically impossible to obey speed limits. And now that we're riding without insurance it's even more important that we don't get nabbed for breaking the law. 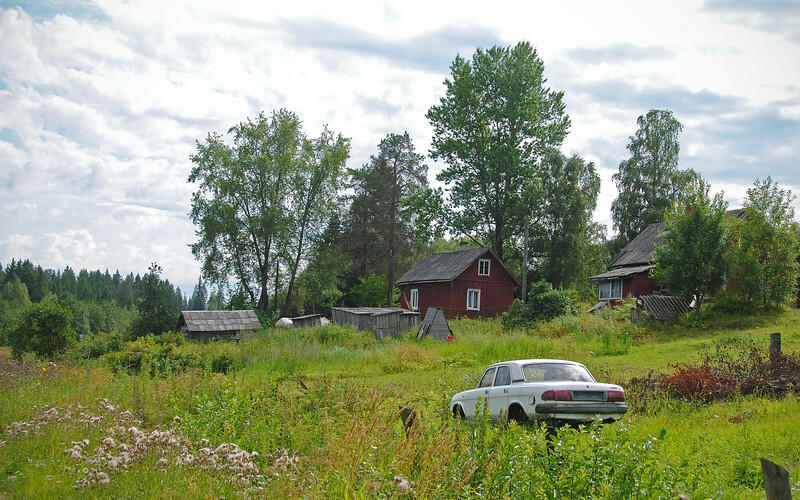 Lots of old shacks and broken down cars in the yards in rural Russia. Red Necks? Red. Necks. The geography here is not so much different from Scandinavia, lots of trees. The greenery is more wild, less maintained and the road coming out of the border crossing was terrible, but once we were on the main highway, it seemed fine. There weren't a lot of cars around since we're kind of far away from any major urban centres up here, but so far we haven't seen any evidence of those crazy Russian drivers. As he rode by he saw our license plates, so he turned around to talk to us. His English was good and he told us of some places where we could stop to grab food on the road. Nice guy! We actually rode on for a while longer and stopped in one of the small towns that the main road passes through. Neda ducks into the grocery store to pick up some lunch for us and I walk around to take some pictures. Most of the buildings are non-descript, I wouldn't call them Soviet-style, but they weren't modern. 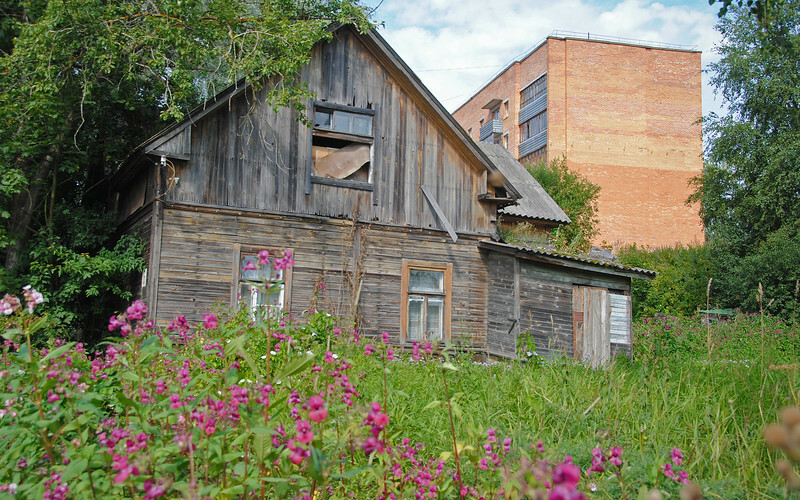 There did seem to be a lot of run-down buildings here. The economy doesn't seem as robust as Finland or Scandinavia. Also I noted that the most common fashion on men walking around on the street are army fatigues. And it's obvious that they're not actually in the army. And then we pass this on the road! I *HAVE* to get a picture with this! 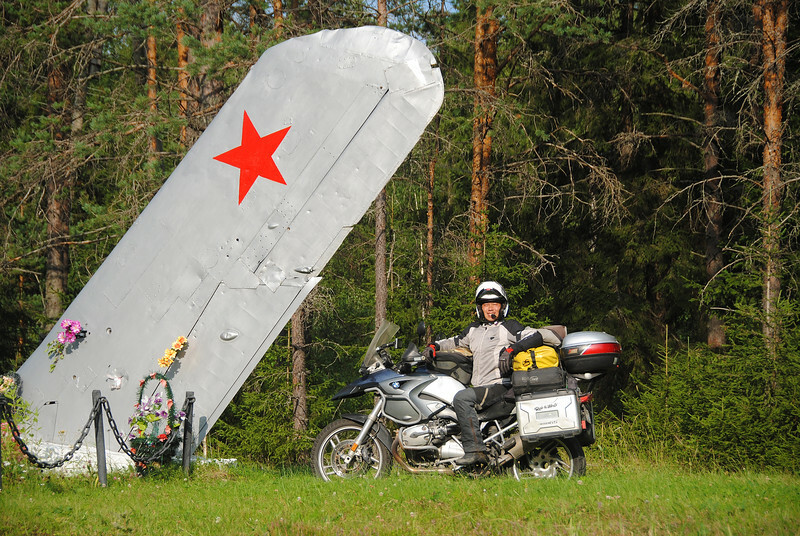 It looks to be the tail or a wing of a Soviet airplane planted as a monument on the side of the road. I ride offroad to get to the monument, a little bit worried that KGB would come and take me away for breaking the law, but I was excited because this kind of stuff was what I wanted to see! We were behind one of them in traffic trying to make out the symbol on the badge, a stylized sail, and Neda said, "Oh, it's a ship! Did you know the Croatian word for ship is Ladja.... ooooooh!" I could see the lightbulb turn on above her helmet. Neda's language skills are going to come in handy here in Russia. I didn't know they still make Ladas. Here's a newer one that we were talking about. Lovin' the huge sail in the back! 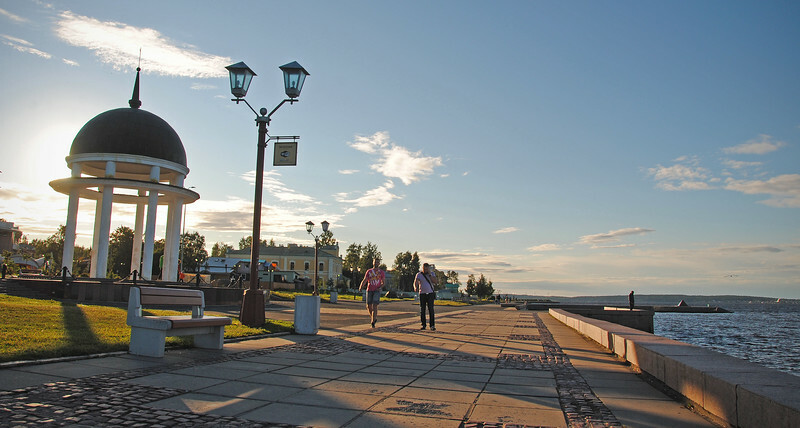 Our first stop in Russia is a small city called Petrozavodsk. 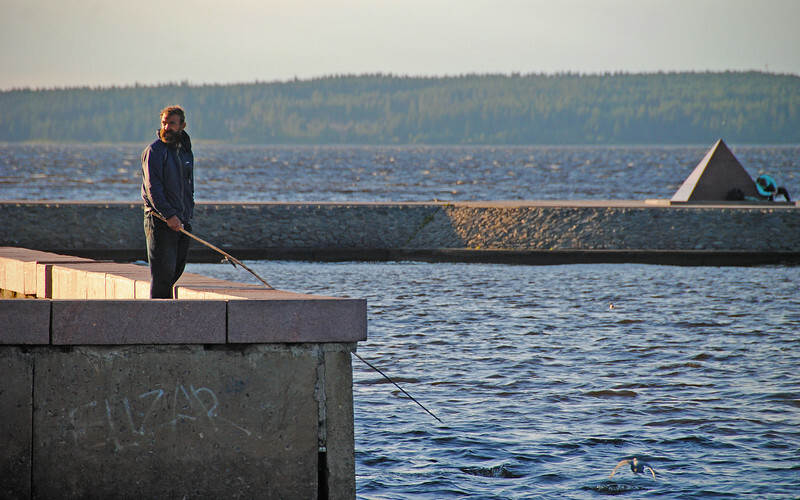 It's the capital of the region that we're in, the Republic of Karelia, and is about four hours away from the border. All the signs are written in Cyrillic, so I have to memorize what Petrozavodsk looks like in foreign squiggles. It looks like this: "Петрозаводск". Yeah. Good luck with that, MonoLingualGene! 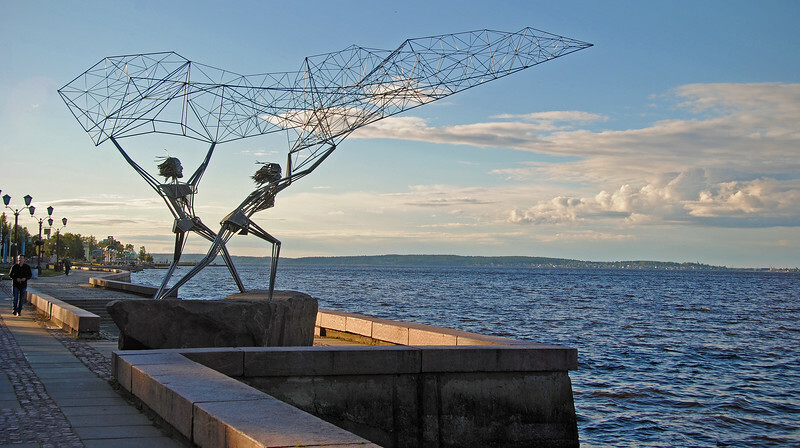 By the way, I love saying the word, Petrozavodsk! I think that's probably the most Russian-sounding word you could ever come up with. 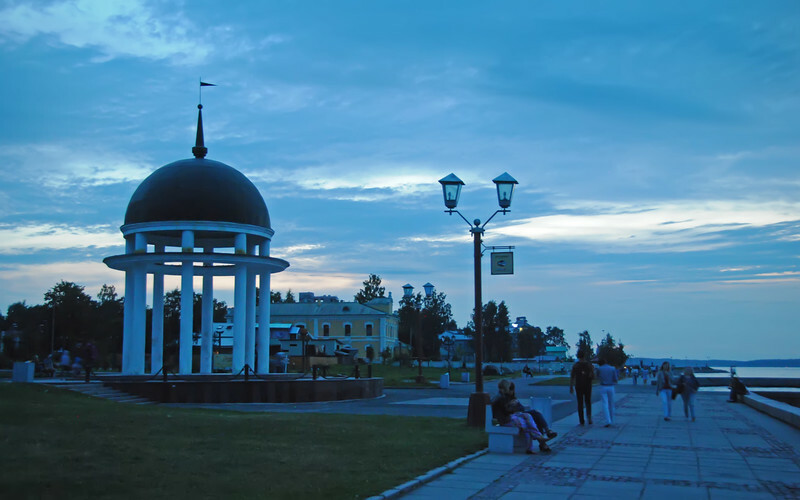 Petrozavodsk. It sounds like a word you would use to describe Vodka that's so strong that it tastes like Petrol. And when you say it, you have to pronounce it with a drunken Russian accent: "Da Petrazavodsk, tovarisch! Nasdarovje!" 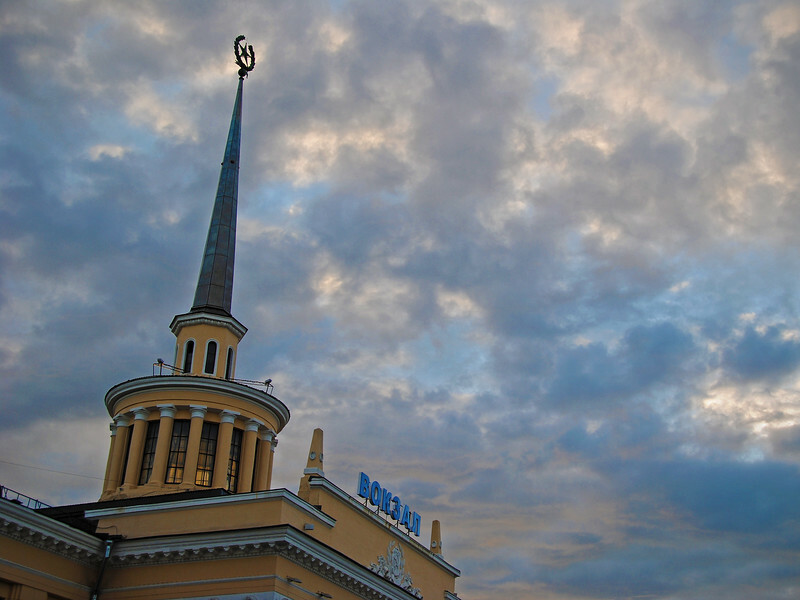 Petrozavodsk railway station, right beside our hotel. I love the star at the top of the spire! 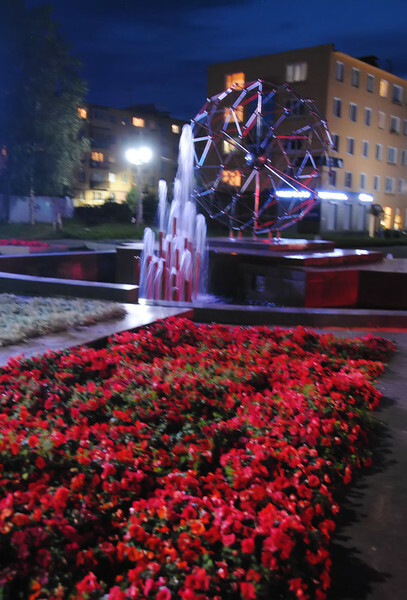 The star lights up red at night. Cool. "Is it east vs west? Or man against man? Can any nation stand alone...."
Ahhh! Get out of my head, Survivor! Although Petrozavodsk is not a very pretty town, I am totally loving all the signs in Cyrillic, it makes it feel so exotic. 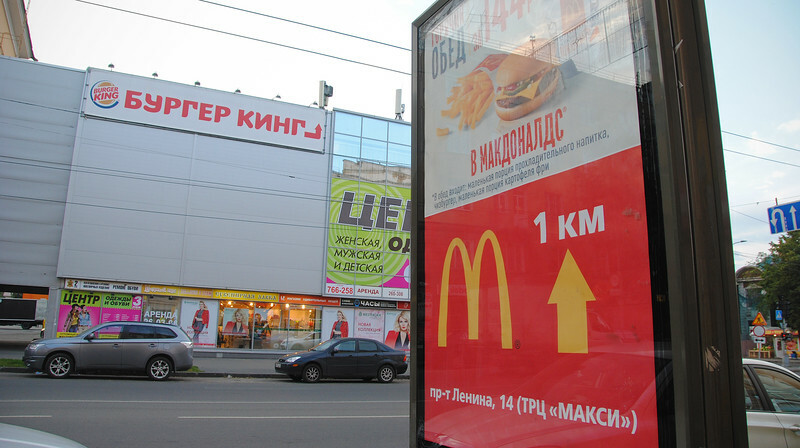 And seeing these Western companies' signs in Cyrillic reminds me of when the first McDonalds opened in Russia back in 1990. I remember when that happened, it was big news at the time. 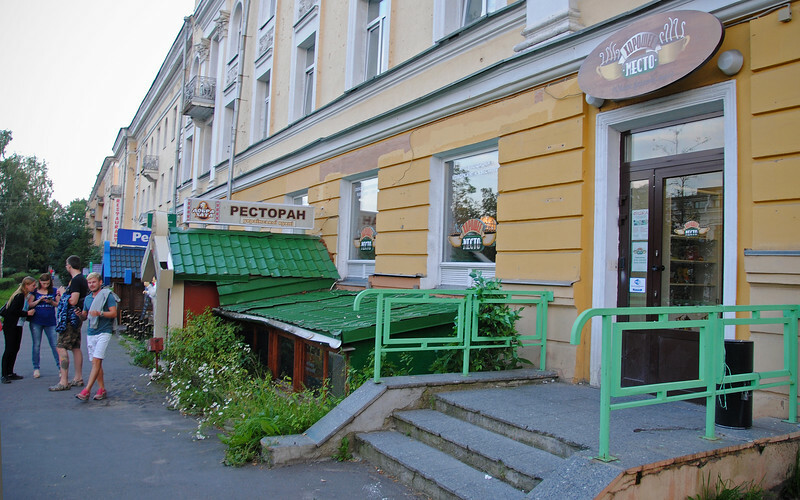 The sign on the coffee shop reads "Central Perk" in Cyrillic. Haha! 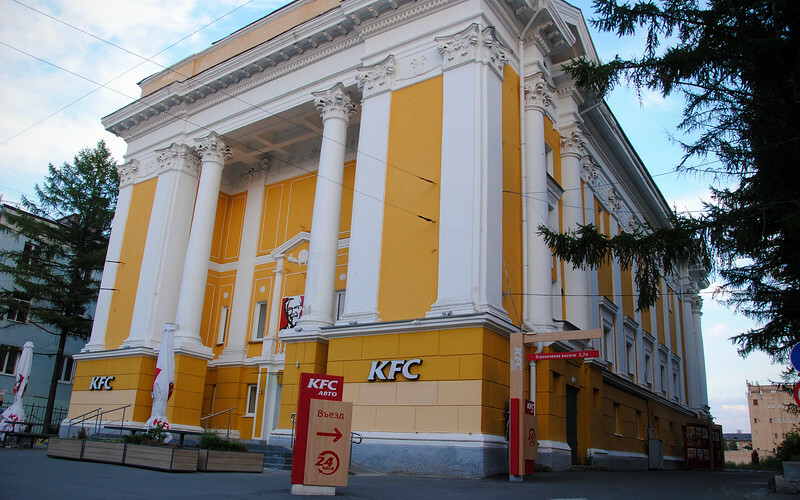 We wanted to try some Russian food, so we went on the Internet to find the most popular Russian restaurant. There's a lot of game meat on the menu, but we were here for one thing: bear! Unfortunately it wasn't in season. But I'm getting the impression that we're out in the boonies if bear is on the menu. At the boardwalk, there was a motorcycle meet going on. Too dark to take good pictures, but here's one anyway. Seeing all these motorcycles we wanted to rush back to the hotel, grab our bikes and ride down to pose and hang out with these guys! Whohoo! Evgeni and Neda in Russia! 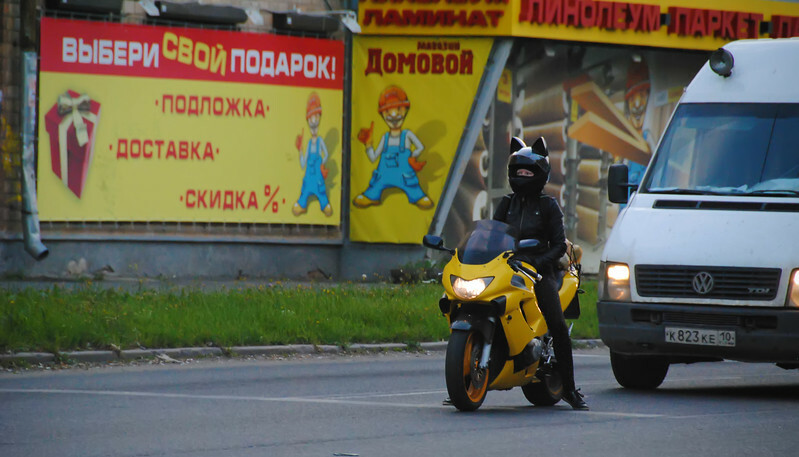 On motorcycles! So friggin' КФФL!!! I can't wait to see more of it! Here's a little earbug to celebrate!